In this note we present the derivation of Einstein formula using the framework of classical dynamics with the addition of the expression for the relativistic momentum . A quick comparison is also made with the usual derivation of Newtonian kinetic energy. We’ll consider a body with rest mass that starts from rest and reach the speed . It’s energy is equal to the work done to make the body reach its final speed . That’s the classical kinetic energy (KE) acquired by the body. We’ll calculate the integral in two different ways: a) with a substitution and using a trigonometric function for the ratio and b) without the substitution, keeping the original variables and following the usual rules for differentiation and integration. 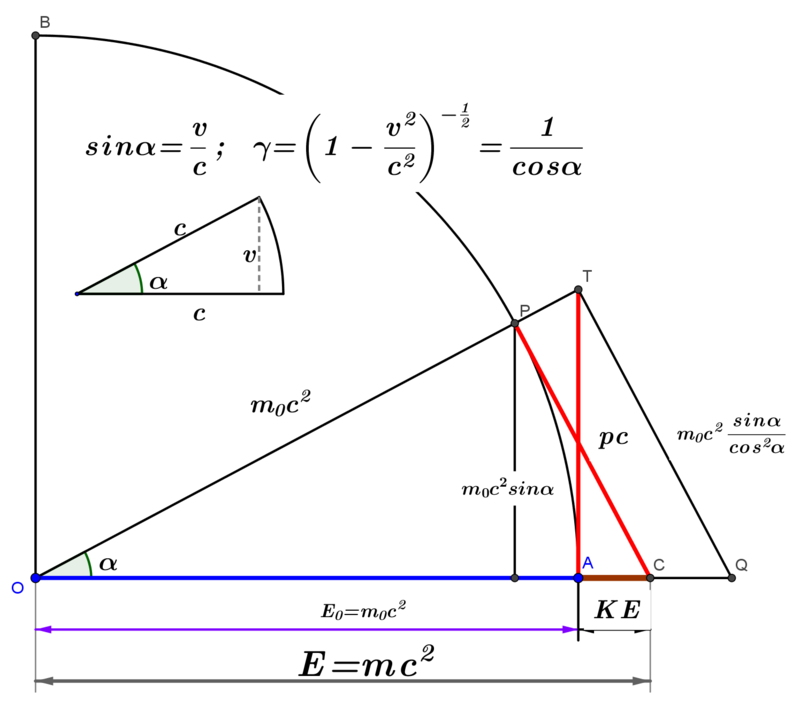 Above equation leads to Einstein well-known formula when we define (total energy) as the sum of the kinetic energy (the energy due to the speed acquired) and the intrinsic rest energy (the base energy due to the rest mass only, ). that follows from the simple application of Pythagoras’ theorem to the triangle . We have reached the same result of the first calculation (with the “trig” substitution) but with some more effort and no evident geometric visualization and guidance.